For the past several months I have been collecting imagery for my course at the Pilchuck Glass School. The instructor, Kari Russell-Pool suggested we start keeping a ‘clip art’ file. Everything that intrigues us creating a record of the way we see the world. Then I came upon Morphologic. Obviously I love their videos- but I also feel connected to their music which is very reminiscent of Brian Eno‘s ambient land masses, and Andrei Gravelle‘s soundscapes. I’ve been trying to find a collection of Morphologic’s music, I would really like to buy a copy(ies) for my iPod. something I’ve recently been researching is the Discosoma sanctithomae. 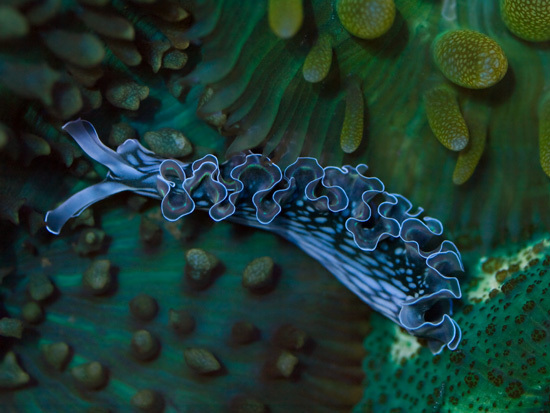 Here CoralMorphologic has captured a DiscoSoma shown with a ‘lettuce’ nudibranch. Previous Post My heart is on SALE!